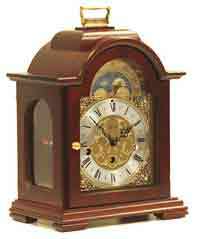 The Howard Miller 613-182 Lynton has been the benchmark of the bracket style keywound mantel clocks for over 20 years. The hand-crafted case is all wood in cherry with a solid carved arched cherry top featuring a polished brass finished handle on top. 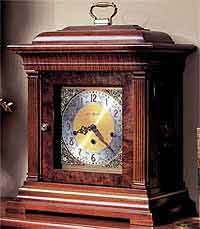 The Brass finished dial offers a silver chapter ring and decorative corner spandrels. Finished in Cherry Bordeaux on select hardwoods select veneers on solid wood. 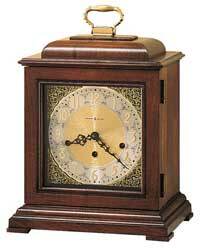 The solid cherry hinged front door allows easy access to the dial for winding once a week. German made Keininger key-wound, quarter hour Westminster chime movement with chime silence option lever and durable bronze bushings. Size: Height 14-3/4", Width 11", Depth 7-1/4". 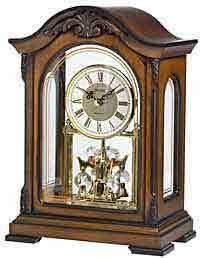 Clocks for sale at The Clock Depot including the 613-182 at discount prices.